[H]istorically speaking, the program of Pope Leo XIII has never been universally implemented in Catholic colleges, universities and seminaries. Not even the ardent efforts of St. Pius X were able to effect this. Until this program is really attempted in a thorough manner, there will always be zealous priests who react to what they only half understand. Reactions against Thomism in the past half century have always been to a pseudo-Thomism, a half-understood St. Thomas. [A]ccording to the mind of the Church, only the sound philosophical and theological principles of St. Thomas are capable of creating a modern Catholic Weltanschauung which will move forward with the modern world and save it for Christ. Ite ad Thomam is not the cry of an antiquarian pope. It is the cry of a prophet who sees what can be the millenium of Christianity in the modern world. Therefore a great responsibility is ours. It is up to us Thomists and Catholics throughout the entire world to show that we can incorporate everything that is good and modern in our age -- and take the great step forward to tomorrow. And where do things stand today with the reception of Aeterni Patris? Need we ask? Does anybody know of good sources for the history of the study of Catholic theology by lay people before the twentieth-century? I am thinking of Continental Universities before and after the Revolution, and especially English laymen who studied in Europe. Moreover, I would be interested to know about the curricula of American Universities in the late nineteenth century. My impression is that it was more or less clerical at first, but I could be wrong. See Bill Vallicella's recent post at Maverick Philosopher. 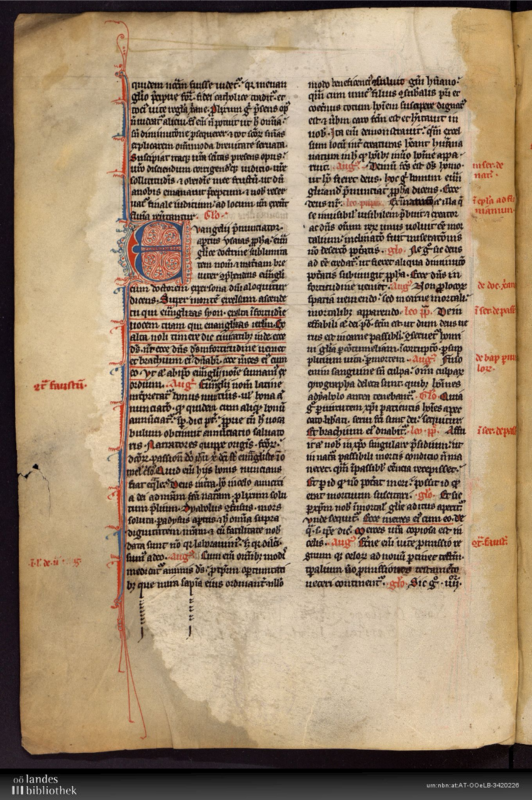 It is well known that Thomas devoted considerable time and effort to deepen his knowledge of patristic sources, as can be exemplified by his composition in the early 1260’s of what is known as the Catena aurea on the Gospels. Recent studies have established that Thomas’ Catena aurea is not merely a compilation of patristic texts but an extensive reworking and reordering of existing sources as well as sources for which he actively searched and of which he had Latin translations made. Given that the standard Marietti edition contains many textual deficiencies and lacks an identification of the sources, for some years now, an edition is underway which aims to remedy these deficiencies. Under the direction of Martin Morard and Carmelo Conticello of the CNRS in Paris, an electronic edition of the Catena aurea is being prepared (or as the full title has it: Thomae de Aquino Catena aurea. Editio scientifica electronica, fontibus repertis textuque emendato, éd. Giuseppe Conticello, Martin Morard, coll. Fabio Gibiino et alii). The project has a most informative website with information on the ratio of the electronic edition, secondary literature, a survey of printed editions, concrete examples of how Thomas went about in composing the Catena, etc. But most importantly, perhaps, for each Gospel there is a PDF-file of the text with the most up to date version of the text and the identification of the sources so far. Here is the website: https://big.hypotheses.org/catena-aurea.